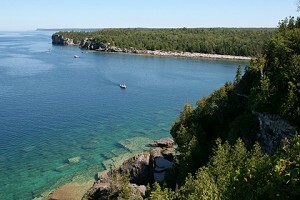 Georgian Bay dominates Rainbow Country with around 30,000 islands that house summer cottages and hidden getaways. The main land feature is Manitoulin Island, which is steeped in First Nations culture. Taking the ferry from Tobermory to Manitoulin Island makes you think you are on a BC Ferry going to Victoria as the waters where Lake Huron and Georgian Bay meet are highly dynamic. From an urban perspective, Sudbury is still considering a nickel mining town (don't miss The Big Nickel) but it also offers Science North with its interactive, high-tech centre to explore the wonders of science. Boat cruises are recommended from Parry Sound as well as the West Parry Sound Museum for native and European colonization. Hikers: take your canoe and enjoy Killarney Provincial Park, which was an inspiration for Canada's Group of Seven artists. The Northern Lights or Aurora Borealis are enjoyed by many communities with festivals as well. Rainbow Country accommodations include hotels, motels, bed and breakfasts and campgrounds. This Inn is a short walk from the beach in Killarney. Featuring free WiFi, a restaurant and a sun terrace. The inn has a fitness center and water sports facilities, and guests can enjoy a meal at the restaurant. Free private parking is available on site. A flat-screen TV, as well as an iPod docking station are available. This Lodge in Killarney offers a seasonal outdoor pool and water sports facilities. Free WiFi is available and free private parking is available on site. There is a private bathroom with a shower in each unit and includes a hot tub and sun terrace. This straightforward, rural motel is located in Wahnapitae. It is close to museums conservation areas. Unpretentious rooms come with en suite bathrooms, full kitchens and cable TV, as well as complimentary WiFi. Amenities include BBQ grills, a picnic area and free parking.